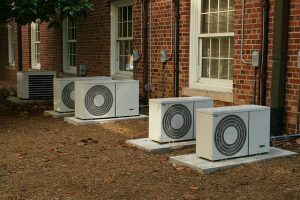 A typical air conditioner consists of many components, including cooling, heating, air cleaning, filtering, air ventilation, and adjusting humidification. With so many processes involved, it is likely for homeowners to experience some issues that might cause the whole unit to stop working as usual. Here’s a list of a few common problems with air conditioners that you should watch out for. This is probably one of the most common issues in most residential and commercial air conditioning systems. If you can’t get your unit to activate or turn on properly, then the cause might come from a blown fuse, tripped circuit breaker, off internal switch, or a faulty or improperly set thermostat. To deal with this issue, you should make sure the thermostat is set to “Cool” rather than “Heat” or “Off” position. Similarly, check the circuit breaker to make sure it is at an “On” position. When you found a blown fuse or tripped circuit breaker, then replace or reset these units. Sometimes, your air conditioners don’t produce enough amount of airflow as you set. The reason mostly comes from dirty duct-work or air filter which has become disconnected, crimped or blocked. To avoid this issue, you should make sure this component is clean. If it is dirty, you should replace or clean it immediately. Also, inspect all duct work and ensure it hasn’t crimped or disconnected. If necessary, have it connected or repaired by a professional contractor. In many cases, you might deal with a compressor with a short cycle, which often turns off or on regularly. This is often caused by an over sized cooling unit, iced coils, leaking refrigerant, or obstructed thermostat. Thus, make sure to check this part for proper operation. Have a professional technician examine for a possible refrigerant leak or charge as well. If the air filter gets dirty, replace it. When your air conditioning system doesn’t dehumidify air adequately at all time, perhaps it is too large for your home. If this issue occurs several times per week, then other possible causes include an over sized system and short cycles. In general, an over sized air conditioner could cool the air so quickly that its thermostat will shut off the whole system before most of the humid air flows have made their way to the cooling coil to be dehumidified. The only feasible solution to this issue is to replace the coils and condensing unit of the air conditioner with a properly sized one. Also, you could attempt to increase the load of cooling artificially by using additional duct-work to air condition your basement or garage space. An air conditioning system plays an essential role in every household. That’s why it is necessary to clean and maintain it regularly to ensure the unit can operate in the best conditions. These are just a few common problems that you often see with air conditioners. There are still many other complicated issues that require the help of professional services.